Although the rights to water and sanitation are not specifically stated in the ICESCR, however, as water and sanitation are fundamental parts for every human being to sustain his/her life and health, therefore, they are also regarded as main elements for the fulfillment of the right to an adequate standard of living (Article 11 ICESCR) and the right to health (Article 12 ICESCR). In this light, the Committee of Economic, Social and Cultural Rights (CESCR) has finally adopted a General Comment No. 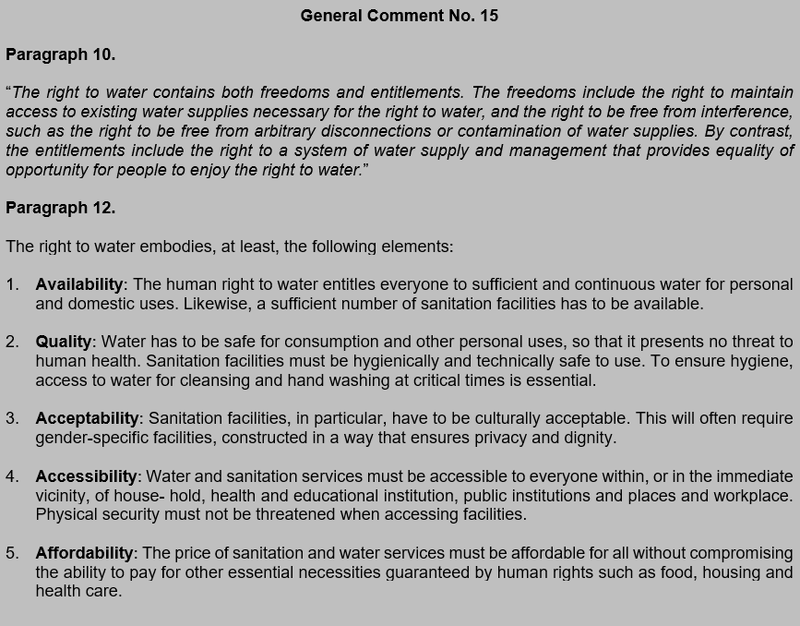 15 on the right to water, which also includes the right to sanitation. At the national level, the rights to health and an adequate standard of living are also enshrined in the 1945 Constitution. These rights are also reiterated in the Law No. 11/2005 a law on the Ratification of the ICESCR. Furthermore, Indonesia had once adopted a law regarding water resources management, namely the Law No.7/2004, but it was annulled by the Constitutional Court in 2015. Potable water is still inaccessible for the majority of the Indonesian population. The UNPDF indicates that there are, at least, 42.8 percent of the population without sustainable access to an improved water source, while approximately 55 million people (22 percent of the population) still practice open defecation in Indonesia. Pollution, catchment degradation, over-exploitation and poor management are the main factors threatening water quality and security, as well as accessibility. 6.1 By 2030, achieve universal and equitable access to safe and affordable drinking water for all. 1. Increased access to services for adequate and sustainable drinking water and sanitation. b. Access to adequate drinking water. 6.2 By 2030, achieve access to adequate and equitable sanitation and hygiene for all and end open defecation, paying special attention to the needs of women and girls and those in vulnerable situations. 1. Increased access to services for adequate and sustainable drinking water and sanitation. b. Percentage of regencies/municipalities adopting the Hygenic and Healthy Lifestyle Guidance (PHBS) (Baseline 2014: 40%, target 2019: 80%). 6.3 By 2030, improve water quality by reducing pollution, eliminating dumping and minimizing release of hazardous chemicals and materials, halving the proportion of untreated wastewater and substantially increasing recycling and safe reuse globally. 1. Centralized municipal-level system of wastewater infrastructures in 438 cities/regencies. b. Increased capacity of raw water infrastructures for households, urban areas and industries (Baseline 2014: 51,44 m3/second; target 2019: 118,5 m3/second). e. Number of built dams. – Improved rehabilitation and conservation efforts to reduce unproductive lands for the benefit of watersheds and water protection for Priority Watersheds. h. Coverage of constructed/improved soil water irrigation. (target 2019: 3.482,00, no baseline). 6.6 By 2020, protect and restore water-related ecosystems, including mountains, forests, wetlands, rivers, aquifers and lakes. 1. Improved rehabilitation and conservation efforts to reduce unproductive lands for the benefit of watersheds and water protection for Priority Watersheds. f. Number of priority lakes, with average of <1% shallowing from each lake’s depth inasmuch as 15 priority lakes. g. Number of priority lakes with decreased erosion level to a tolerable limit in catchment area in 15 priority lakes. Although access to improved water and sanitation remained low for many Indonesians, the poorest households are the most affected by it. According to UNICEF, 400 children, mostly came from poor and most marginalized families, die everyday in Indonesia from treatable diseases, such as pneumonia and diarrhea. Diarrhea attributed to poor quality of water, sanitation and hygiene (WASH) has taken the lives of 73.921 children in 2015 alone. Remote indigenous communities in Indonesia are also deprived from access to potable water. Many indigenous communities are still practicing a nomadic lifestyle near forests and very much relied on natural water sources such as rivers and lakes, while the massive pollution attributed to extractive industries, as well as deforestations, which have increased erosion, are threatening the access to water for remote indigenous communities. Therefore, indigenous communities, especially the remote ones, should also be considered as a priority group to receive assistance with regard to improving their access to potable water and their awareness on adequate sanitation. Furthermore, community involvement and supports are also important to ensure the sustainability of water and sanitation management in the local communities. UNICEF, Some 35 million more children under five at risk if child mortality goal not met, 2013, available at: https://www.unicef.org/indonesia/media_21391.html. In light of the aforementioned gaps in the indicators under Goal 6 of the SDGs, we would like to propose the following additional indicators to strengthen the impacts of the national development strategy to ensure availability and sustainable management of water and sanitation for all. B. Access to adequate drinking water. – Proportion of poor population, including indigenous population, that have the access to, at least, 60 liters per day for a single person (in line with WHO minimum standard and the Public Works Ministerial Decree No. 14/2010). b. Percentage of regencies/municipalities adopting the Hygenic and Healthy Lifestyle Guidance (PHBS) (Baseline 2014: 40%, target 2019: 80%). – Proportion of poor households, including indigenous groups, that have the access to an adequate sanitation. 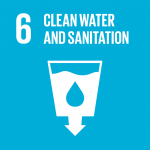 6.b Support and strengthen the participation of local communities in improving water and sanitation management. NA NA – National water resource management and sanitation policies that contain provisions and procedures for participation of local communities. The UN country team can support the GoI to achieve its targets on water and sanitation management through the continuation of the UN community-led sanitation, as well as the Water, Sanitation & Hygiene (WASH) projects. UNICEF and WHO, as the leading organizations to implement WASH project, can provide a strong partnership and technical assistance for the GoI to obtain targets related to SDG 6 to ensure availability and sustainable management of water and sanitation in Indonesia.